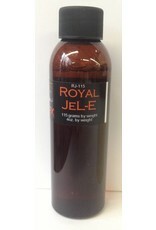 Royal JeL-E is an excellent water based mold release developed especially for casting silicone into silicone. This unique solution combines the ease of brush application and the removal with warm water, leaving the cured silicone surface free of contaminants. Apply Royal JeL-E by lightly brushing into the silicone mold creating a film over the entire surface. Use a hairdryer to speed-up the drying process. Rinses off clean with warm water. - Also great for floating clay sculptures off plaster lifecasts. Brush a liberal amount of Royal JeL-E over the lifecast, working it well into the surface. Use a hairdryer to speed up the process. Apply a second coat of Royal JeL-E. Place the sculpture in a bucket of water or water bath and let it soak. After a few hours the Royal JeL-E will begin to liquefy and start to release the clay sculpture from the lifecast. Gently pry the clay away from the lifecast, floating the pieces off. Use Vinyl or Nitrile gloves and eye protection when working with Royal JeL-E.